The goal of optimal thermal management is to avoid critical temperatures inside components and assemblies. The component elements must be operated within the prescribed temperature range. Among other things, thermal resistance (Rth) is a function of the thickness (d), of the mediums used as well as the thermal conductivity of the material (λ) and the surface area available for heat conduction (A). 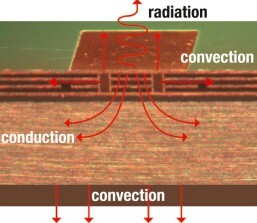 In electronic systems the heat produced is primarily dissipated in one of three ways: radiation, convection and conduction. The design of the printed circuit boards has a great influence on the thermal conduction. The goal is to create the best possible thermal path with good heat conduction to the heatsink. The size of the surface area plays a positive role here. 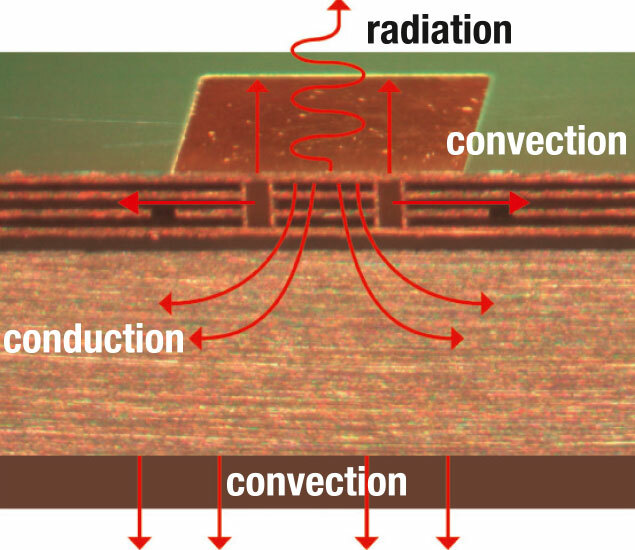 In practice, early planning of heat dissipation technologies into the design of the printed circuit board and the component assembly has proved effective for thermal management. On the one hand, this should optimise the effectiveness and price of constructing the printed circuit board. On the other hand, it will prevent the need to make subsequent extensive modifications to the design.